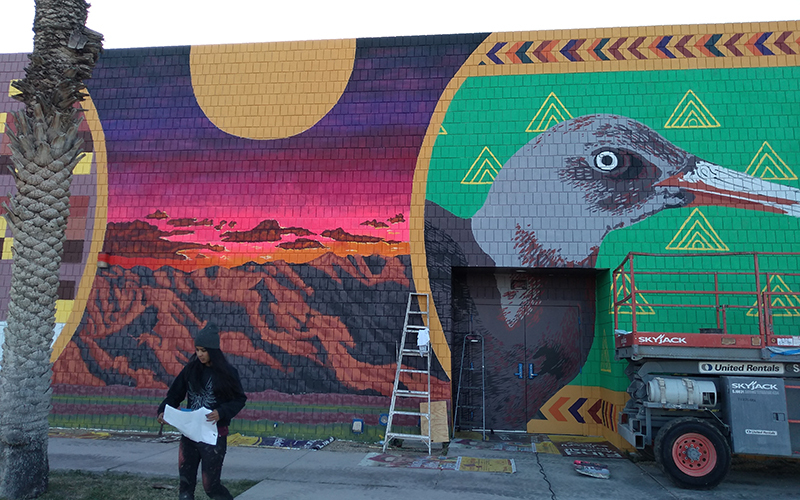 YUMA, Ariz.— The Center for Biological Diversity and Arizona Western College will celebrate the unveiling Monday of the 20th installment in the Center’s national Endangered Species Mural Project. The 76-foot by 22-foot mural features two Sonoran Desert species, the Sonoran pronghorn and the Yuma clapper rail. The mural is being painted on the wall of the college’s theater building by artist Roger Peet and Phoenix-based muralist Lucinda Hinojos, with help from students at the college. “We feel really fortunate that local art supporters – the McKivergan family – chose AWC as the host site when they decided to bring this public art series to Yuma. This project echoes the multi-faceted service a comprehensive community college tries to provide. It’s a fine arts interpretation of a critical issue in environmental science that impacts the larger world,” said Dr. Daniel P. Corr, Arizona Western College president. What: Endangered Species Mural Project public celebration. Artists will be available for interviews at the site this week and at the celebration. Center and college staff also will be available for interviews. When: Monday, Feb. 11, 3 p.m. to 4 p.m. The Endangered Species Mural Project has installed 19 murals in public spaces around the country. The project collaborates with artists, scientists, and organizers to celebrate local endangered species and encourage the public to make connections between conservation and community strength. Other murals already in place include borderland species such as the Mexican wolf and ocelot in El Paso, Texas; a blue whale in Los Angeles; a monarch butterfly in Minneapolis; a jaguar in Tucson, Ariz.; and grizzly bears in Oakland, Calif. The mural in progress. Photo by Roger Peet. This image is available for media use.